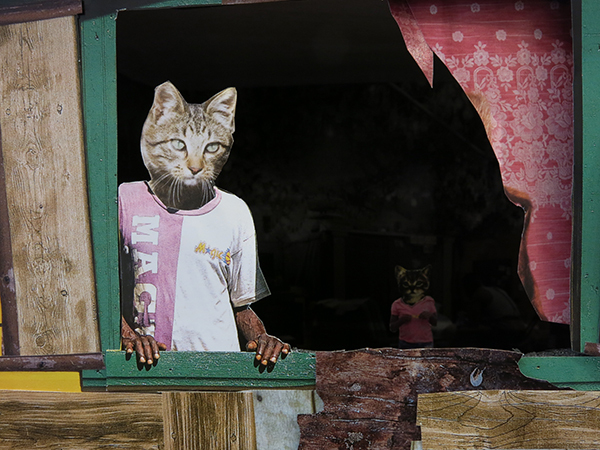 In Panama City, five photographic projects tackle the contradictions of urban life. Panama City defies logic. On a bay facing the Pacific Ocean, flanked by its famous canal, the city’s steel-and-glass spires rise toward the sky. But signs of poverty and radical income disparity are conspicuous, as in the uncomfortable proximity of those high-rises to fishermen’s shacks. Lush vegetation alternates with aggressive construction, cosmopolitanism with a small-town mentality, and colonial history with the fervent wish to look forward. Vibrant yet chaotic, the place is a container for all manner of people, experiences, and journeys. In recent years, however, Panamanian artists working with photography have begun to engage in social and cultural critique. Many use humor and satire to address daily urban life, as well as of national history. The use of wit and the absurd have become important tools for artists in a city where general opinion is still conservative, money courses through the country in forms both legal and illegal, and the level of government corruption seems, at times, a joke. Artists, like most of the city’s citizens, operate in the space of contradiction between fondness and criticism for the urban space that surrounds them. This sentiment is echoed in the work of Darién Montañez, a Panamanian artist with an expansive practice anchored in photography. Trained as an architect, Montañez coined the term feoclasicismo, or “ugly-classicism,” as a way to describe a hybrid style of architecture common in Panama City, which displays a penchant for excessive neoclassical ornamentation. He has a growing collection of photographs documenting this style. In a limited-edition photobook, he writes: “Where has this glorification of bad taste come from? Bad in its quality, bad in its malignity, and almost so bad it’s wonderful?” He wraps biting humor in a veil of tenderness for his city and its architectural acrobatics, and his fertile thinking extends across online platforms such as tumblr, WordPress, and Instagram. The artists’ piece Under the rug (2015) addresses how a city’s attempts at reinvention can mean pushing aside anything that doesn’t fit into the manicured image of progress. In the video, two disembodied figures clad in campy, blue-and-red suits—the colors of the Panamanian flag—sweep all manner of things under a patch of grass. The brushing away of objects—which start out as small debris like discarded lottery tickets or dominos and grow to include broken plastic guns and beheaded dolls—comments on the country’s deficient environmental policies, but also alludes to the sloppy concealment of all sorts of public information. Invisible Hands (2014), where white-gloved conjure and then make cash disappear, as if by magic, is an even more direct condemnation of the practice of making things—money—disappear. Together, the videos suggest that hidden debris as well as secret sums will ultimately, inevitably, come to light. The legacy of the Canal Zone, a U.S. territory until 1999, is still a subject of negotiation by historians and artists. Engaging with one chapter of its history, artist José Castrellón’s recent exhibition examined the photographs from the January 9, 1964, massacre. That day, local students who had attempted to place a Panamanian flag next to the American flag in the Canal Zone were shot and killed by U.S. military. The event marked a turning point in U.S.–Panamanian relations. Later that month, a stunning photograph by Stan Wayman from the ensuing riots was featured on the cover of Life magazine. In the photograph, students climb a lamppost to plant a flag on top. Now, over fifty years later, Castrellón juxtaposes this historic image—blown up, in a red frame—alongside his own photographs of men climbing a palo encebao’, or greased maypole, a folk custom in Panama. The photographs ask: Can the past be so easily reduced into a visual game? Paula Kupfer is a writer and editor based in Brooklyn and Panama.